After the morning hustle and bustle, the atmosphere at Taitung county's Central Market quietens as every stall shuts for the day and their owners return to the comfort of their homes. Alone lamp shines on a vegetable stall. With head bowed, Ms Chen Shu-chu silently sorts out the vegetable leaves as she waits for the occasional afternoon customer. Decades of hard work have caused the fingers on her right hand to curl and joints to swell; her feet have deformed slightly. Ms Chen leads her life with a daily routine. Waking up at three in the morning, she makes her way to the vegetable wholesaler and sets up her stall, which she tends till seven or eight in the evening. Being the first to arrive and last to leave, the other stall owners have fondly given her the title of "market manager". In the dark and damp market, Ms Chen, nearing her 60s, holds the stall her father left her dearly.Yuan-Jin Vegetables is her everything. 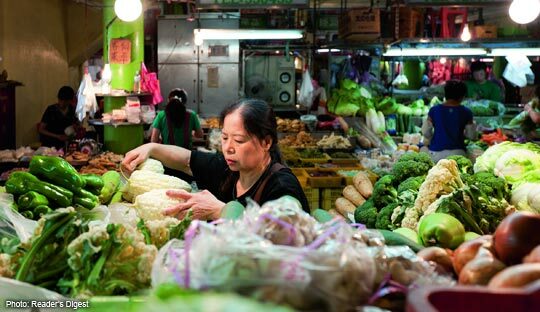 With her vegetables selling at "a bundle for NT$30 (S$1.30), three bundles for NT$50", she earns only marginal profits. Yet, her frugality has allowed her to donate about NT$10 million towards various charitable causes, including helping schools, orphanages and poor children. The selfless generosity of a woman with such humble income has placed her under the international spotlight. In March, Forbes magazine named her one of 48 outstanding philanthropists from the Asia-Pacific region. A month later, Time magazine selected the year's top 100 influential people and she emerged under the Heroes of Philanthropy category. 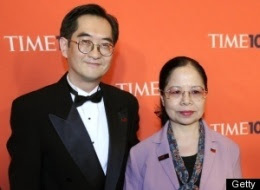 Despite the honour of receiving the Time award in New York, gaining global recognition, and a personal meeting with President Ma Ying-jeou, all Ms Chen really cares about is her vegetable stall. If not for President Ma and the Foreign Minister personally convincing her to go, she would not have agreed to visit New York, as she felt that "this is not a competition and I did not win anything". Amid the frenzy of applying for a passport and preparing for the visit, her main concern was that her regular customers would not get their vegetables. Ms Chen has become a celebrity in Taitung county. The local authorities decorated her stall with congratulatory posters and banners hailing her as the Pride of Taitung and the Model of Philanthropy. There are fans who turn up at the stall with a vegetable basket and a camera, hoping for a picture with Ms Chen. Despite all the attention, she remains humble. "I have done nothing extraordinary and anyone who wants to can do it. There are many other charitable people; we just don't know about them," she said. Ms Chen, who is unmarried, added: "I do not place great importance on money. When I donate to help others, I feel at peace and happy, and I can sleep well at night." She also feels for the poor, having experienced hardship in her younger days. Born in 1950, Ms Chen lost her mother after completing her primary-school education. Her mother was admitted to hospital because of difficulties in labour and the family had to pay an insurance of NT$5,000 before medical attention could be granted. Ms Chen saw her father asking their neighbours for money, but it was too late to save her mother. The eldest daughter in the family, Ms Chen had to grow up overnight. She gave up her studies and dedicated her life to helping at the vegetable stall. When she was 18, her younger brother fell sick and the illness dragged on for over a year, gradually depleting the family's savings. Doctors suggested that the family send her brother to Taiwan National University Hospital, but they could not afford the fees. Mr Huang Shun-zhong, a teacher at Ren-ai Primary School, started a donation drive. Unfortunately, her brother could not be saved. After experiencing the kindness bestowed upon her family, Ms Chen made up her mind to help the poor once she was able. When her father died 17 years ago, Ms Chen, a devoted Buddhist, generously donated NT$1 million to Fo Guang Shan Monastery. In 2000, she donated NT$1 million to her alma mater, Ren-ai Primary School, to set up an Emergency Relief Fund to help poor children obtain financial help. Assisting in the setting up and maintenance of the fund is Mr Li Guo-rong, who teaches Ms Chen's nephew. In 2001, Mr Li had a plan to build a library for the school and estimated the cost to be between NT$4 million and NT$5 million. When he approached Ms Chen, in the hope that she might contribute NT$50,000, Li was shocked when she said she would fund the entire project. The school was sceptical, but Ms Chen was determined. In May 2005, the two-storey library was completed and named Chen Shu-chu Library in honour of the "Vegetable Market heroine" alumnus. She had donated NT$4.5 million. Ms Chen's ability to donate such large sums of money has led many to ask: How can a mere vegetable seller earn so much? "Spend only what you need, and you'll be able to save up a lot of money!" said Ms Chen. Since 1996, she has donated NT$36,000 to help three children in the Kids Alive International organisation. To achieve this, she explained that she empties her loose change into three little cardboard boxes at home every night. "This is a simple act that anyone can do, isn't it?" she said. Ms Chen leads a very simple life without any luxuries. She does not have any desire for material gain nor any form of enjoyment. Work, she said, is her enjoyment. "I love my work. If I didn't, would I be able to work 16 hours a day?" All she needs is food and a place to sleep. Everything else is a luxury. She does not buy expensive clothes as "I do not socialise much, hence, there is no need for such beautiful clothes. The clothes from the roadside stalls are good enough for me, and, even then, I like to bargain". Her daily meals cost less than NT$100: a bowl of vegetarian rice and a bowl of noodles for NT freeze whatever that cannot be finished, spend another NT$20 on a can of gluten and add that to the rice with some hot water. "This becomes porridge and is very tasty," she said. She also sleeps on the hard floor, a habit from her younger days when she started working at the vegetable stall. The comfort of her warm bed made getting up early to go to the wholesaler very difficult, especially during the cold winter months. Hence Ms Chen made up her mind to sleep on the cold floor, where she would not run the risk of being late. Has business improved after winning the award? "Business is as usual," she said. "I still need to sell my vegetables. Not much has changed." Advertisers have approached her to film commercials; financial managers have offered to manage her finances and other well-wishers have offered to donate money. She rejects these advances politely. "It is easy to return borrowed money, but difficult to return a favour," she said. "I have to be very careful in handling money matters,"she added. Even when customers tip her, she refuses to accept. "Buying from my stall is already a form of support," she explained. The only commercial Ms Chen was willing to take on was for the Bureau of National Health Insurance, in memory of her beloved mother. She requested all shoots be done beside her stall so as not to affect her business. The only payment she was willing to accept was a black T-shirt given by the Bureau. Since her return from New York, Ms Chen has been working even longer hours. She has a new goal: To collect NT$10 million to set up a Chen Shu-chu Bursary aimed at helping poor children pay for school fees and medical bills, things she could not afford as a child. "All I need is to sell a few more vegetables, save a little more money, in addition to a number of insurance policies that are near the end of their term. A lot of people are also willing to donate. I am sure there won't be any problems," she said. Mr Li, who treats Ms Chen like a sister, said that setting up the bursary is actually a good way to let her retire from selling vegetables and start influencing society with her reputation, in the hope that there will be more generous "Chen Shu-chus". As for Ms Chen, she said: "My philosophy in life is simple: If doing something makes you worried, then it must be a wrong thing. If it makes you happy, then you must have done the right thing. What others say is not important." She is content with what she has and feels that as long as she "lives a life she wishes for and does the things she wants, that is good enough". A MOST INSPIRING TRUE STORY OF A HUMBLE, SELF-SACRIFICING COMMON WOMAN......A RARE BREED IN THIS MODERN RAT-RACE WORLD OF OURS!
" Life is a bunch of experiences and I am going to make it as incredible as possible"
One man's meat is another man's poison. One can feel good about what he is doing, but it may cause hardship to others! Eg a man loves loud music. He enjoys himself while others are in discomfort! So the philosophy the "if you feel good about what you are doing, it must be right" may just have a flaw in it?? What is your opinion, Mr Robert Foo? The intelligent one would only think of himself. Whereas the smarter one always think of others first. Usually smart people are richer than the intelligent one. If you have wiseness you would understand what I had written. How?